In the post Trenberth Still Searching for Missing Heat, we discussed the recent Balmaseda et al (2013) paper “Distinctive climate signals in reanalysis of global ocean heat content”, of which Kevin Trenberth was a coauthor. Roy does note that arguments about continued ocean warming to depth “…depend upon global deep ocean temperature changes being measured to an accuracy of hundredths or even thousandths of a degree…”. That’s why all of the adjustments to the ocean heat content data are so critical to this discussion. 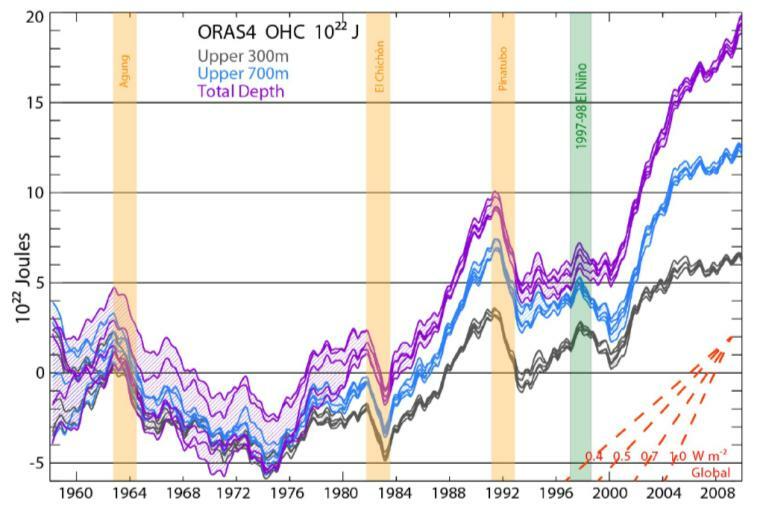 If we were to consider the “unadjusted” ocean heat content data (represented by the UKMO EN3 data in Figure 1) to be correct, then the ocean heat content for depths of 0-2000 meters flattened as soon as the ARGO floats had reasonably compete coverage of the global oceans in 2003-04. It’s only when the ocean heat content data is corrected, tweaked, adjusted, modified, whatever (represented by the NODC data in Figure 1), that the global ocean heat content continues to warm in relative agreement with climate models. April 8th, 2013 by Roy W. Spencer, Ph. D.
While I don’t necessarily buy Trenberth’s latest evidence for a lack of recent surface warming, I feel I need to first explain why Trenberth is correct that it is possible for the deep ocean to warm while surface warming is seemingly by-passed in the process. Then I will follow up with observations which run counter to his (and his co-authors’) claim that an increase in ocean surface wind-driven mixing has caused the recent lack of global warming. Can Deep Ocean Warming Bypass the Surface? It depends on what one means by “warming”. A temperature change is the net result of multiple processes adding and subtracting heat. Warming of the deep ocean originally caused by radiative forcing of the climate system cannot literally bypass the surface without some effect on temperature. But that effect might be to keep some cooling process from causing an even steeper dive in temperature. It’s like adding a pint of warm water, and a gallon of cold water, to a sink full of room temperature water. Did adding the pint of warm water cause the temperature in the sink to rise? To appreciate this, we first need to understand the basic processes which maintain the vertical temperature distribution in the global oceans. The following cartoon shows a North-South cross section of measured ocean temperatures in the Atlantic. (3) vertical mixing from wind-driven waves, the thermohaline circulation, and turbulence generated by flow over ocean bottom topography (the latter being partly driven by tidal forces). The key thing to understand is that while processes (1) and (2) continuously act to INCREASE the temperature difference between the warm mixed layer and the cold deep ocean, the vertical mixing processes in (3) continuously act to DECREASE the temperature difference, that is, make the ocean more vertically uniform in temperature. The average temperature distribution we see is the net result of these different, competing processes. And so, a change in ANY of these processes can cause surface warming or cooling, without any radiative forcing of the climate system whatsoever. 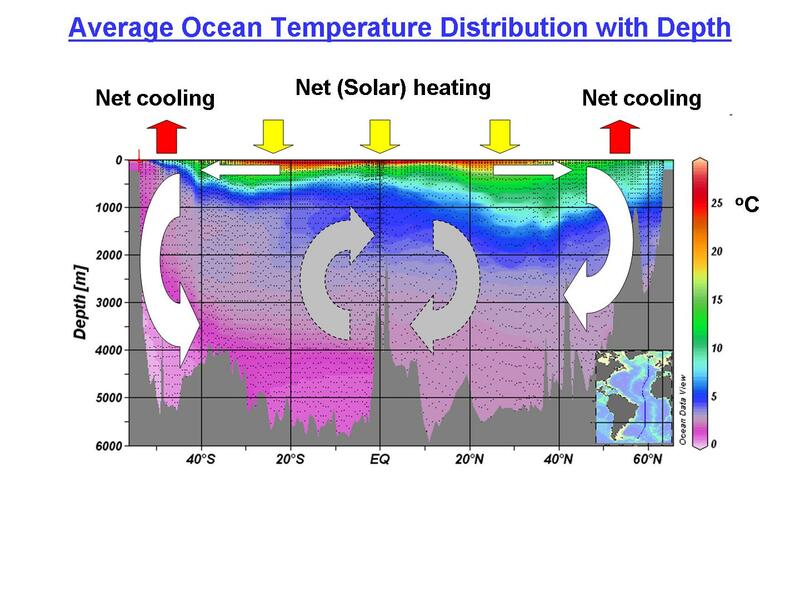 Scenario 1) Warming with NO change in ocean mixing: It this case, surface warming is gradually mixed downward in the ocean, leading to warming trends that are a maximum at the ocean surface, but which decrease exponentially with depth. Scenario 2) Warming with a SMALL increase in ocean mixing. This case will result in weaker surface warming, and slightly stronger warming of the deep ocean, both compared to Scenario 1. The warming still might decrease exponentially with depth. Scenario 3) Warming with a LARGER increase in ocean mixing. This case could lead to an actual surface temperature decrease, but warming of the deep ocean, similar to what I believe Trenberth is claiming. Yes, the surface waters “warmed” before the deep ocean in Scenario 3, but it was in the form of a weaker temperature drop than would have otherwise occurred. Because of the immense heat capacity of the deep ocean, the magnitude of deep warming in Scenario 3 might only be thousandths of a degree. Whether we can measure such tiny levels of warming on the time scales of decades or longer is very questionable, and the new study co-authored by Trenberth is not entirely based upon observations, anyway. I only bring this issue up because I think there are enough legitimate problems with global warming theory to not get distracted by arguing over issues which are reasonably well understood. It takes the removal of only one card to cause a house of cards to fall. But it also points out how global warming or cooling can occur naturally, at least theoretically, from natural chaotic variations in the ocean circulation on long time scales. Maybe Trenberth believes the speedup in the ocean circulation is due to our driving SUVs and flipping on light switches. He has already stated that more frequent El Ninos are caused by anthropogenic global warming. (Except now they are less frequent — go figure). In some sense, natural global warming and cooling events are made possible by the fact that we live within an exceedingly thin warm surface “skin” of a climate system in which most of the mass (the deep ocean) is exceedingly cold. Any variations in the heat exchange between those two temperature worlds (such as during El Nino with decreased mixing, or La Nina with increased mixing) can cause large changes in our thin-skinned world. It than sense, Trenberth is helping to point out a reason why climate can change naturally. Have Ocean Winds Increased Recently? Trenberth and co-authors claim that their modeling study suggests an increase in ocean surface winds since 2004 has led to greater mixing of heat down into the ocean, limiting surface warming. 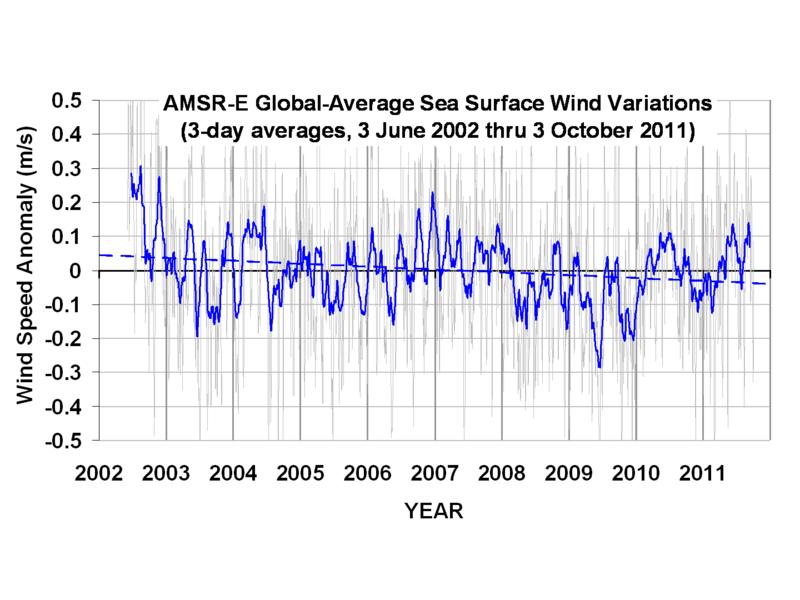 I don’t know about you, but I don’t see an increase in surface winds since 2004 in the above plot. This plot, which is based upon wind retrievals that have been compared to (as I recall) close to 1 million buoy observations, really needs to be extended back in time with SSM/I and SSMIS data, which would take it back to mid-1987. That’s on my to-do list. So far, I would say that the so-called missing heat problem is not yet solved. I have argued before that I don’t think it actually exists, since the “missing heat” argument assumes that feedbacks in the climate system are positive and that radiative energy is accumulating in the system faster than surface warming would seem to support. For the reasons outlined above, Trenberth’s view of deep ocean storage of the missing heat is still theoretically possible since increased vertical ocean mixing doesn’t have to be wind-driven. But I remain unconvinced by arguments that depend upon global deep ocean temperature changes being measured to an accuracy of hundredths or even thousandths of a degree. Finally, as I have mentioned before, even if increased rate of mixing of heat downward is to blame for a recent lack of surface warming, the total energy involved in the warming of the deep oceans is smaller than that expected for a “sensitive” climate system. Plots of changes in ocean heat content since the 1950′s might look dramatic with an accumulation of gazillions of Joules, but the energy involved is only 1 part in 1,000 of the average energy flows in and out of the climate system. To believe this tiny energy imbalance is entirely manmade, and has never happened before, requires too much faith for even me to muster. First consider that the ARGO floats have had “complete” coverage of the global oceans since 2007. The Earth’s oceans and seas cover about 361 million square kilometers or 139 million square miles. There were 3566 ARGO floats in operation in March 2013. If the floats were spaced evenly, then each ARGO float is sampling the temperature at depth for a surface area of approximately 101,000 square kilometers or 39,000 square miles—or an area about the size of Iceland or the State of Kentucky. Second, consider that the ARGO era is when the sampling is at its best, but before ARGO temperature sampling at depth was very poor. Refer to the following animation. Temperature sample maps at 1500 meters (6MB). There is little observational data at depths of 1500 meters prior to ARGO. In other words, we have little idea about the temperatures of the global oceans to depths of 2000 meters and their variability before ARGO. Third, on top of that, consider that ARGO floats have been found to be unreliable, hence the need to constantly readjust their observations. Do we have any idea about the variability of the temperatures and ocean heat content of the global oceans to depth? Simple answer: No. For more information on the problems with Ocean Heat Content data, refer to the post Is Ocean Heat Content Data All It’s Stacked Up to Be? 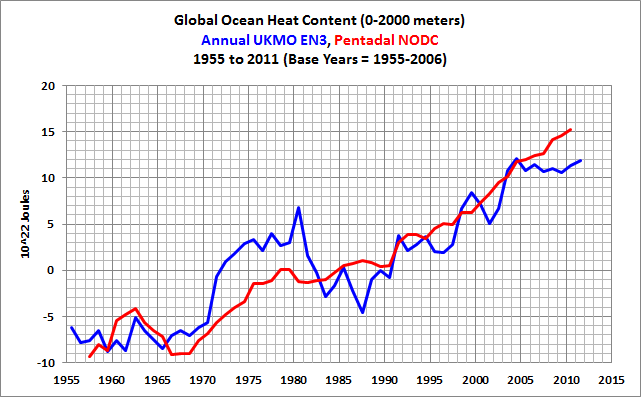 and NODC’s Pentadal Ocean Heat Content (0 to 2000m) Creates Warming That Doesn’t Exist in the Annual Data – A Lot of Warming. This entry was posted in CAGW Proponent Arguments, Ocean Heat Content Problems, Ocean Processes. Bookmark the permalink. My email address in in the log-in file, send me a reply ! Faux_Science_Slayer: I don’t find a discussions ocean heat content (the topic of this post) in the links you provided. Therefore, I find it difficult for you to justify stating that I’ve been misinformed. And if you persist, you’ll likely find your comments making their way into my spam filter. I’ve seen you praise the video of Geert Jan van Oldenburg: “Reliability of regional climate model trends”: Now you go to climate explorer and get the temperature data from De Bilt and the data from the AO. Look at the AO and these temperatures. Be sure to look at the winter temperatures too. You can do that for the CET too (and others). …was very good at explaining why climate models could not be used to portray future decadal and regional temperatures and precipitation like we do with weather reports: That is, they can’t say that there is a “x”% chance that CET or De Bilt temperatures will warm “x” deg C and that precipitation will increase “x” percent, because the models are incapable of being used for predictions. Pingback: A Different Perspective on Trenberth’s Missing Heat: The Warming of the Global Oceans (0 to 2000 Meters) in Deg C | Watts Up With That? You can hear (see) Van Oldenburg say in the video that the Nethetlands warmed twice as fast as the world. The warming of the Netherlands started in 1989 and is due to a change in the AO. Take the NH from about 45-65 N and 0-180E and you will see the same patern (see the CET too). A jump in 1989/1990 where after ther is hardly any more warming (don’t forget Pinatubo). The winters in the Netherlands from 1990 on are, with one exeption, colder than that of 1990. Pingback: Open Letter to the Royal Meteorological Society Regarding Dr. Trenberth’s Article “Has Global Warming Stalled?” | Watts Up With That? Pingback: Part 2 – Comments on the UKMO Report “The Recent Pause in Global Warming” | Watts Up With That? Pingback: Open Letter to Kevin Trenberth – NCAR | Watts Up With That? Pingback: An Odd Mix of Reality and Misinformation from the Climate Science Community on England et al. (2014) | Watts Up With That? Pingback: Bad News for Trenberth’s Missing Heat – New Study Finds the Deep Oceans Cooled from 1992 to 2011 and… | Watts Up With That?